Tamoxifen helps white blood cells clear multidrug-resistant bacteria in lab and mouse studies. 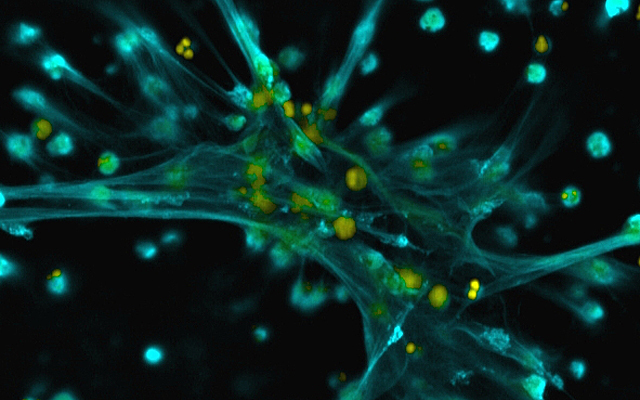 Neutrophils produce bacteria-ensnaring NETs (shown in blue/green) in response to tamoxifen treatment. Researchers at University of California, San Diego School of Medicine and Skaggs School of Pharmacy and Pharmaceutical Sciences have found that the breast cancer drug tamoxifen gives white blood cells a boost, better enabling them to respond to, ensnare and kill bacteria in laboratory experiments. Tamoxifen treatment in mice also enhances clearance of the antibiotic-resistant bacterial pathogen MRSA and reduces mortality. The study is published October 13 by Nature Communications. Tamoxifen targets the estrogen receptor, making it particularly effective against breast cancers that display the molecule abundantly. But some evidence suggests that tamoxifen has other cellular effects that contribute to its effectiveness, too. For example, tamoxifen influences the way cells produce fatty molecules, known as sphingolipids, independent of the estrogen receptor. Sphingolipids, and especially one in particular, ceramide, play a role in regulating the activities of white blood cells known as neutrophils. “Tamoxifen’s effect on ceramides led us to wonder if, when it is administered in patients, the drug would also affect neutrophil behavior,” said first author Ross Corriden, PhD, project scientist in the UC San Diego School of Medicine Department of Pharmacology. To test their theory, the researchers incubated human neutrophils with tamoxifen. Compared to untreated neutrophils, they found that tamoxifen-treated neutrophils were better at moving toward and phagocytosing, or engulfing, bacteria. Tamoxifen-treated neutrophils also produced approximately three-fold more neutrophil extracellular traps (NETs), a mesh of DNA, antimicrobial peptides, enzymes and other proteins that neutrophils spew out to ensnare and kill pathogens. Treating neutrophils with other molecules that target the estrogen receptor had no effect, suggesting that tamoxifen enhances NET production in a way unrelated to the estrogen receptor. Further studies linked the tamoxifen effect to its ability to influence neutrophil ceramide levels. The team also tested Tamoxifen’s immune-boosting effect in a mouse model. One hour after treatment with tamoxifen or a control, the researchers infected mice with MRSA (methicillin-resistant Staphylococcus aureus), a “superbug” of great concern to human health. They treated the mice again with tamoxifen or the control one and eight hours after infection and monitored them for five days. Tamoxifen significantly protected mice — none of the control mice survived longer than one day after infection, while about 35 percent of the tamoxifen-treated mice survived five days. Approximately five times fewer MRSA were collected from the peritoneal fluid of the tamoxifen-treated mice, as compared to control mice. There are two caveats, the researchers said. First, while tamoxifen was effective against MRSA in this study, the outcome may vary with other pathogens. That’s because several bacterial species have evolved methods for evading NET capture. Second, in the absence of infection, too many NETs could be harmful. Some studies have linked excessive NET production to inflammatory disease, such as vasculitis and bronchial asthma. “While known for its efficacy against breast cancer cells, many other cell types are also exposed to tamoxifen. The ‘off-target effects’ we identified in this study could have critical clinical implications given the large number of patients who take tamoxifen, often every day for years,” Nizet said. Tamoxifen is taken daily by hundreds of thousands of patients worldwide for the treatment of estrogen receptor-positive breast cancer. The World Health Organization considers tamoxifen an “essential medicine,” due to its cost-effectiveness and safety profile. According to the breast cancer organization Susan G. Komen, generic tamoxifen cost patients about $100 per month in 2010. Tamoxifen is not the only drug prescribed for other indications that just happen to also boost neutrophil activity. In 2010, Nizet and team reported that cholesterol-lowering statins also enhance NET formation. That study can be found here. Co-authors of this study include Andrew Hollands, Joshua Olson, Jaclyn Derieux, Justine Lopez, John T. Chang, David J. Gonzalez, all of UC San Diego. This research was funded, in part, by the National Institutes of Health (grants HD071600, AI057153, AI052453 and OD008469).